Just to prove we actually completed something this weekend. Here is the curtain looking so visually complex for such a simple shibori technique. It only took Mark two days to notice it. I suspected that Iris was looking for a pink dress much like her beloved "blue Princess Aurora dress" which she wore to tatters; she still wears it today as a nightgown. She was very fond of telling everyone that it had three different colors of blue! Here she is wearing it at her 4th birthday party. That's "the bug lady" and her travelling zoo beside Iris. 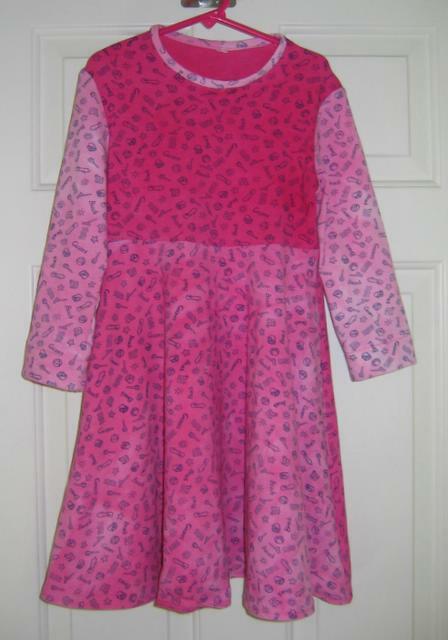 The original dress was Simplicity 5827 in size 4. Her "heart dress" was also in the same size. 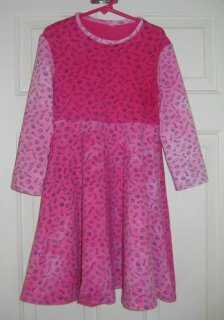 The "pink Princess Aurora dress" is size 6. The dye job on the large skirt yardage was not very even. I told her that an uneven dye job makes the dress look that much more luxurious. She didn't look convinced. Some people plan their sewing. I pick my next sewing project by the color of thread that is already in the serger. 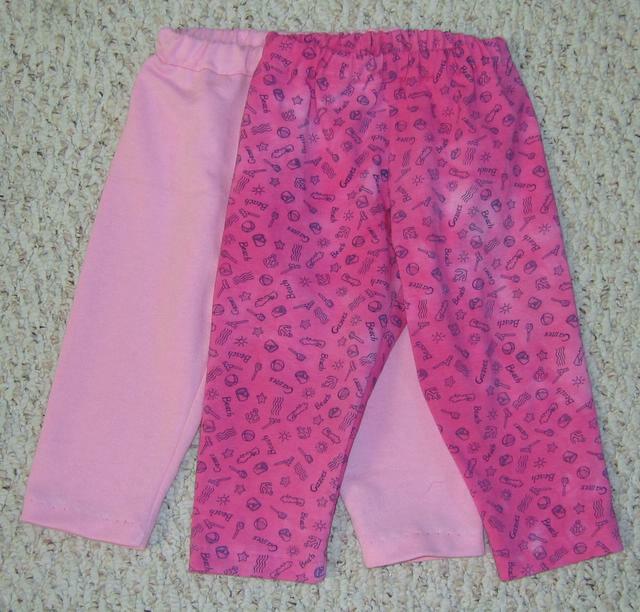 Iris' cousin got two pairs of Kwik Sew's "Sewing for Babies" pants in pink (size L to fit 12 mo). Iris loved our new bed so much, she tried to sleep UNDER it. She moved the middle row of bins out of the way, dragged pillows, a blanket and a yoga mat in with her, and fell asleep in "her cave". I told her not to sleep under my bed. She reluctantly went back to her room. Later, I could hear her snoring, but she wasn't in her bed. She was way under her own bed! I managed to pull her out partway without waking her up. 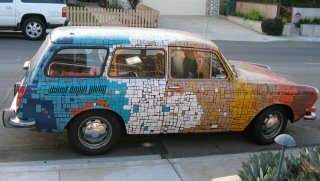 Yesterday, we saw this car on our walk. Who knew that duct tape came in so many colors? 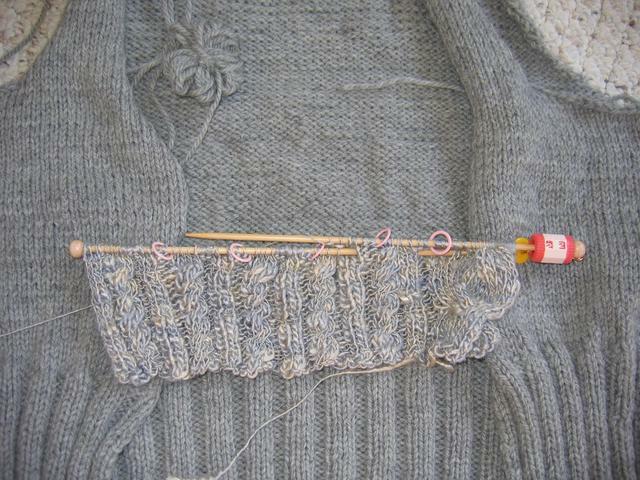 I finished the Norah Gaughan cabled cardigan body and decided to start on the long scarf piece. Because the Patons Classic Wool was a bit scratchy and I am wool sensitive, I decided to use Art Fibers Golden Siam (silk tussah) for the scarf. However, working cables in the Golden Siam, which is loosely spun thin and thick single-ply, turned out to be quite tricky. Worse yet, the hard work doesn't show against the variegated yarn. So now, I am thinking of using Classic Wool for the whole thing. 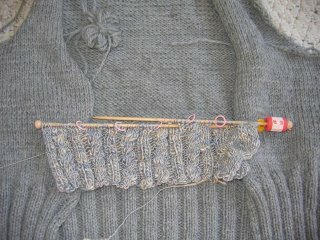 My skin is so sensitive, that the wool scratches my left index finger because I control tension by winding yarn around that finger. Yet, the wool seems to be less scratchy as I work with it. Maybe it is wishful thinking? I couldn't make up my mind last night, so I decided to sleep on it and cast on for the first sleeve. In other news, we have the perfect storm of Halloween, Iris' birthday and a satellite launch all in the same week. She had told me that she wanted to be a bathtub/shower combo and I had collected a white box, white fabric, a shower head, silver duct tape and bamboo stakes (for the shower curtain surround) to make the costume. Then she changed her mind (T-3 days!) and wanted to be the pink Princess Aurora. I decided that strangling her would take up more time to explain to the authorities than making the d**n dress. She also quickly said that, it didn't have to be perfect, I could use whatever I had, even if it had other stuff besides straight pink, as long as it was predominantly pink. Then she gave a well-rehearsed pleading look. In the spirit of making do with what I have instead of rushing out to buy stuff, I pulled out all my pink knits from the stash. The stuff I had is on the bottom. 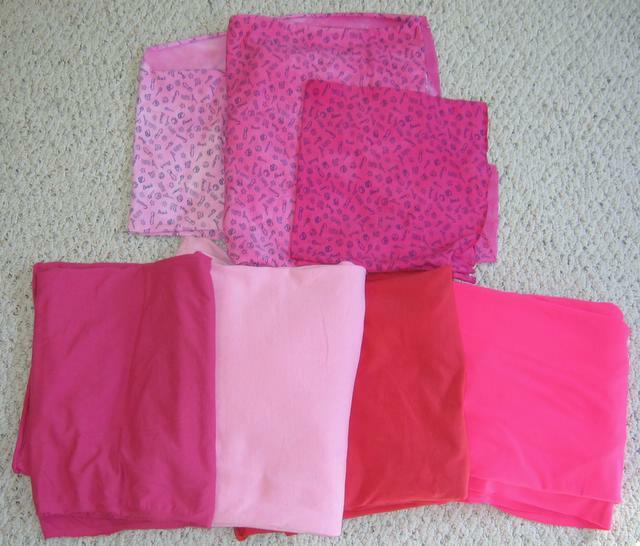 From left to right, 1 might work; 2 is a french terry and too heavy, though the color is great; 3 is too coral, and 4 is too neon. I then remembered the white/blue print cotton/lycra that I bought when she was a baby. We had a dye session this morning. The top three fabrics were the cotton/lycra overdyed with varying amounts of Fuchsia Red. 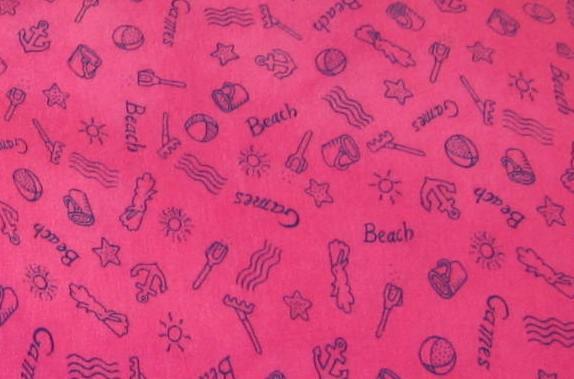 Can you see the beach theme print? Iris asked to dye her art apron in a swirly pattern. 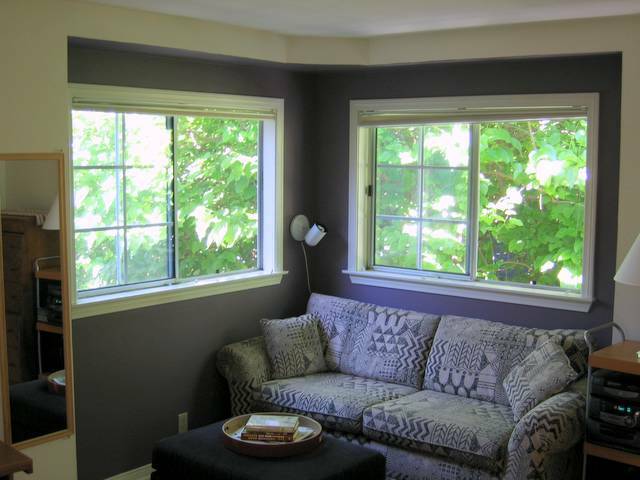 The plain white IKEA curtain in the bedroom was treated with 2 teaspoons of "Plum Blossom" dye. 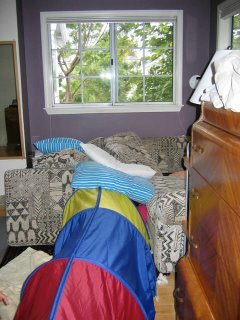 First, I took out the hem and sewed the curtain into a tube. Then, I ruched and twisted it over a bucket. 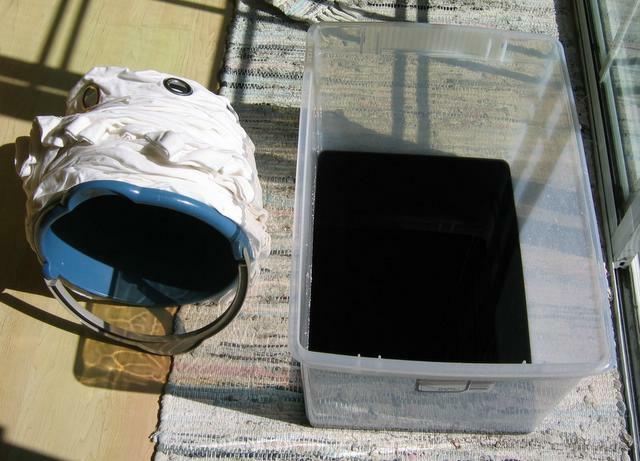 I put the dissolved dye and half a gallon of soda ash and rock salt solution into a Sterilite 66 quart bin and rolled the bucket/drape around a bit. After a couple of hours in a sunny window, I washed it. The drape is in the dryer right now so I can't show it. Stay tuned. It looks great IMHO. See the Dharma Trading Procion color card; isn't plum blossom lovely? The dress is done. Iris loves it so much, she is wearing it to bed tonight. The curtain is rehemmed and hung. It looks like ripples of water in a stream. It is only with great restraint that I do not repeat this shibori technique on every other large piece of fabric in this house. I was wondering why I had upper respiratory problems today. It doesn't take a rocket scientist to figure out why. But one did ask me today if I noticed any effects of the fire upon my asthma. Another duh. Why hadn't that occurred to me? 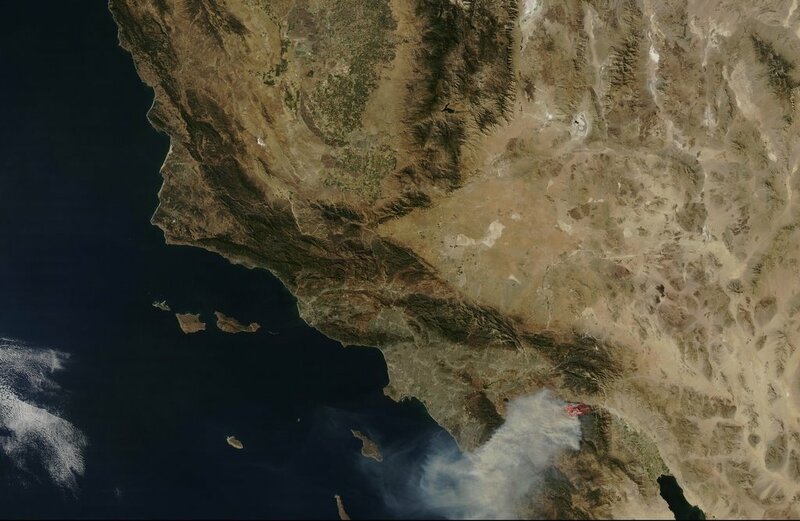 The NASA Aqua satellite's MODIS instrument took a spectacular image of the Cabazon fire in Riverside county, near Palm Springs, this afternoon. Check out this and other images at the MODIS rapid response system website. More about southern California wildfires here and here. Iris’ school is observing National Red Ribbon Week. I have some misgivings about the whole thing. The kids are supposed to dress a certain way each day of the week. Monday, they were supposed to wear team jerseys to “team up against drugs”. Tuesday, they were asked to bring in a stuffed animal for “hugs, not drugs”. Today, Wednesday, they were to wear their clothes backwards for “turn your back to drugs”. Tomorrow they are asked to wear their pajamas “to put drugs to sleep”. Friday, they are to dress in red. Her school is not an isolated case. Read the Washington Post article about how DC area schools are observing red ribbon week with all the hoopla of a school spirit week. The whole thing makes me queasy. My child seems to think this is a week long “wacky Wednesday”. What does any of this have to do with substantive drug education? We quiz her every evening about what she has learned. She says that drugs are bad and you shouldn't do them. What makes drugs bad? She says that they can kill you. No word yet about what is a drug and what is a medicine. How do the kids on ritalin feel about this? Just as each child is the most beautiful baby in the whole world in his/her age category, mine is the most beautiful bed in the whole bedroom. 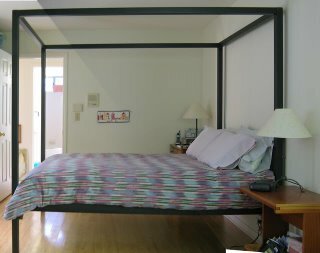 Actually, it made about.com's list of top 10 most beautiful beds. 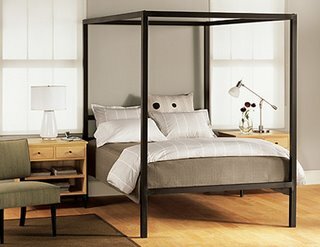 I've wanted the Architecture bed from Room and Board since the first time I saw it. Here is what the bed looks like in a studio setting. I didn't want my bad Photoshop photomerge job to detract from the beauty of the bed. Everyone who sees this bed mentions that it has great Feng Shui. Look at all that wonderful chi circulating around the bed! I took a picture just after we set up the bed to commemorate all that empty space under the bed. It doesn't look like that now. 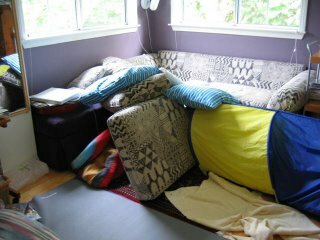 We have our ski and bicycling clothes, my yarn stash and Mark's DVD stash under there now. Remember that California Closets ad where a woman sits in a beautiful closet with only half a dozen items of clothing in it? The woman is blonde; the wood is blonde; the clothes are all exquisitely neutral in color and natural fiber, of course. The fetish of empty space in a land where so few possess it. To leave a 60x80x16 space open is like leaving a whole closet empty just to look at it. It is not going to happen in a townhouse with no attic, no basement, no backyard storage shed, the smallest garage allowed by zoning (and we park our car in it), and a tiny amount of closet space. 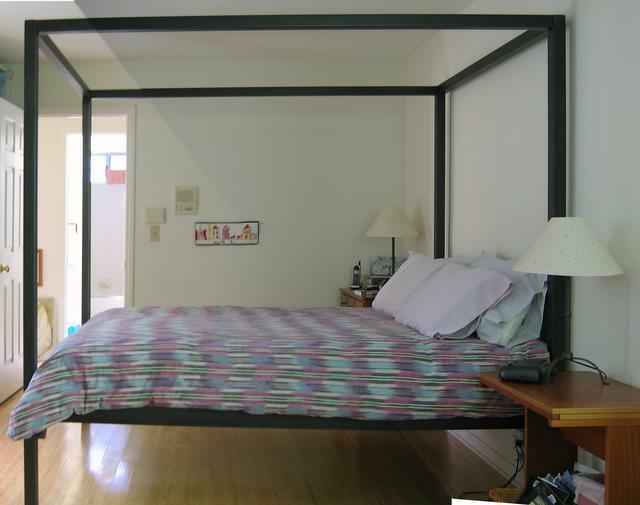 Do people in HK or Taipei leave their underbed space unutilized for better Feng Shui? No, I bet they use platform storage beds and apply Feng Shui mirrors to the bases. Maybe I will embroider some mirrors to the bedskirt when I sew one. Maribeth told me that she read in a Feng Shui book that, if you must store things under the bed, store only things with good Feng Shui like clean linens there. Hmm, yarn by definition has good Feng Shui. I think that the classic musicals can stay under there, but maybe the Martin Scorsese boxed set and A Clockwork Orange will have to move somewhere else. Like the duvet? I made it with a chambray sheet from the sale bin and some indian ikat cotton bought for a few dollars a pound from SAS fabrics on 135th and Hawthorne in Lawndale. I still have a ton of the fabric left, enough to make that Issey Miyake's 10.5 yard dress. I knew there was a good reason to hoard all those 1980's Vogue Individualist patterns. Mark worked like a fiend all weekend when he wasn't watching Lost. Immediately after the symphony, he disassembed our old bed, loaded it up in a rental truck with the aid of a friend and drove to Orange County to pick up the Architecture bed before the warehouse closed. Then he continued south to San Diego where he and his dad assembled our old bed. After having dinner with his parents, he drove home. The next morning, we assembled the new bed and Mark returned the truck. Moments after he arrived home, the Beacon Mattress truck pulled up at our home with the new mattress. Others have mentioned that buying a mattress is as icky as buying a used car. We have not found it so. But this is the 4th mattress we have bought from Beacon Mattress in Torrance. Once we found how pleasant and easy it was to deal with them (especially David), we never even thought about buying a mattress elsewhere. Read about "West Elm" disease in apartment therapy nyc, but only if you are 18 and over. 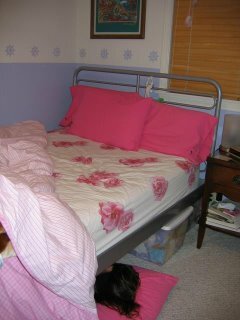 View this bed's CO twin with another me-made duvet. 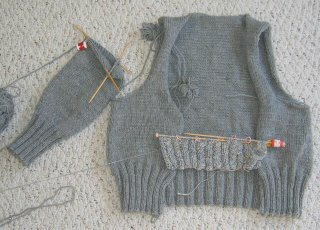 No knitting pictures today, but I made lots of progress on Norah Gaughan's cable cardigan from the fall issue of Vogue Knitting. I am almost done with the body. 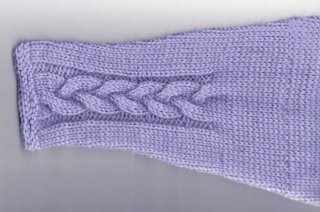 All that stockinette was perfect for watching season two of Lost on DVD with Mark and attending the symphony with Iris this weekend. 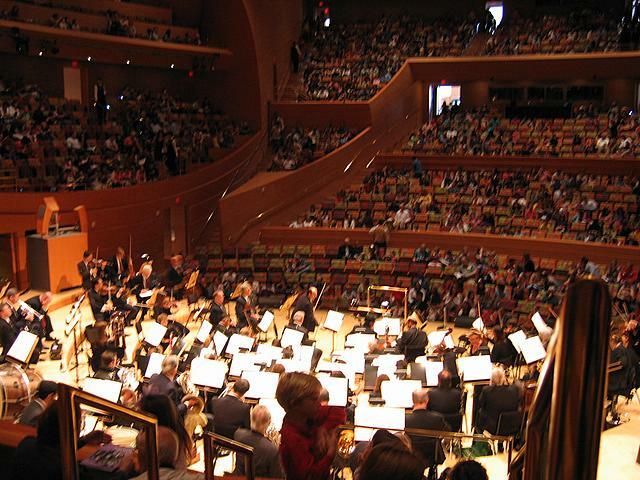 We highly recommend the Toyota Symphonies for Youth concert series. 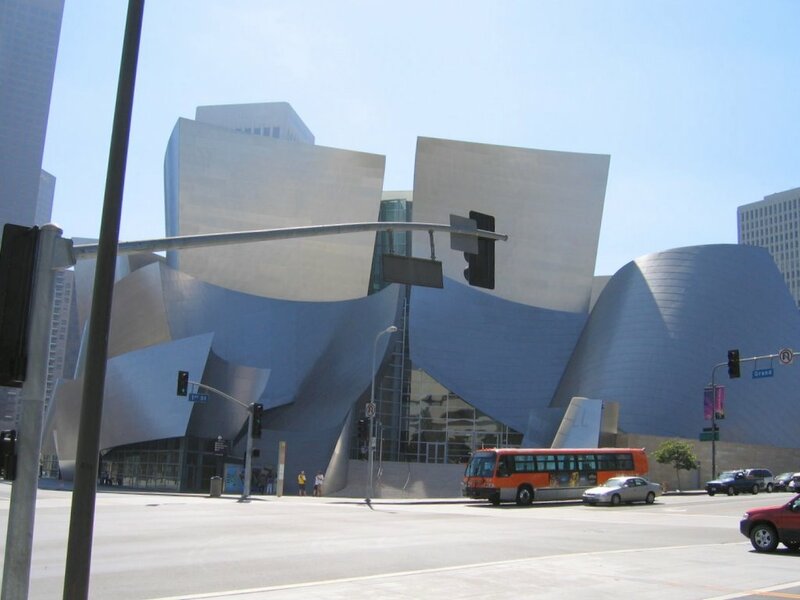 The concerts are short (perfect for children's attention spans) and the activities for children before the concert are also fantastic. Iris took a short dance class and visited the instrument petting zoo before the concert. Had we arrived a bit earlier, she could have made bird puppets, too. Here is the view from the cheap ($18) bench seats. We liked sitting behind the orchestra because we could see the musicians at work. Usually, they are hidden behind the music stands.We were also able to see the facial expressions of the conductor. The acoustics are quite good. 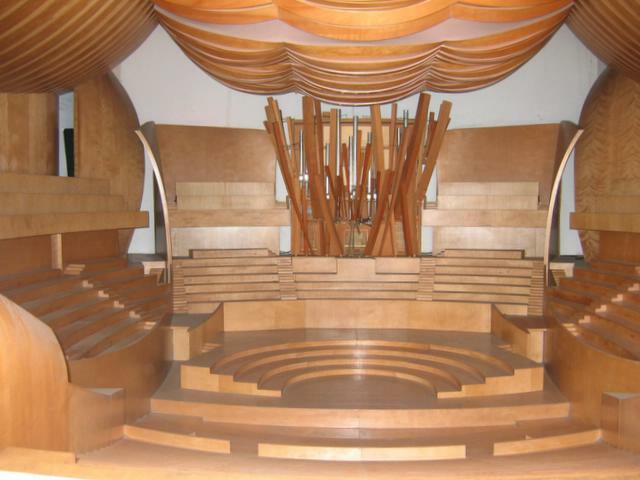 Outside the music center, there was a 1:10 model of the concert hall interior. A sign posted outside said that music was sped up to 10x frequency and amplified in the model in order to test the acoustics. Our cheap seats are slightly to the left of the organ pipes. 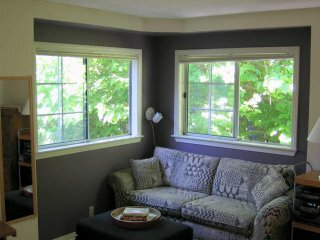 This is the reading and knitting alcove in the master bedroom. This is how it looks during a playdate with 3 other girls. Afterwards, they went downstairs to play with Legos. They made elaborate tower-like things. "Transformers ready? Mermaids! Now princesses! Mermaids again!" I have always revered people who choose to live with so few possessions. Who hasn’t admired the beauty of Shaker interiors? However, I know myself too well to ever believe that I would have the discipline for that. That only heightens my appreciation of others that can. When I showed up for college, I filled up my mother’s subcompact car to the gills. The girl who showed up with just two suitcases and two boxes was legendary. My friend took me to her room to introduce us and the legend graciously allowed me to look inside her closet. Her shirts hung amid all this empty space. I vowed to be more like her. Nevertheless, I continued to accumulate. When I showed up for grad school, I filled my own subcompact to the gills. I also shipped 6 boxes of fabric and sewing supplies with a friend heading for the same school with a trailer in tow. I also mailed my growing collection of books by USPS’s bargain book rate to my new department. 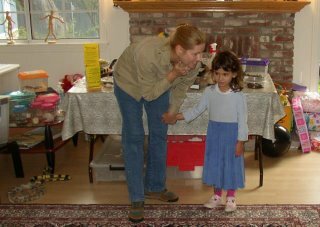 Then I got married and playing house was so much fun. We accumulated more stuff. There were the wedding presents, the dumpster diving triumphs, the estate sales, finds from our travels… It was a good thing that our employer paid for our next move. When we bought our townhouse, it seemed so vast. I thought that it would take a lifetime for us to fill the place. We even took in a roommate for a while because we really didn’t need all the space. Then we had a baby. How can such little people require so much stuff? Have you walked the aisles of Babies R Us, the baby superstore lately? Our baby is a little girl now who has very definite ideas of what she needs. Her taste does not run to ascetic minimalism. It is a constant battle against those plastic tschochkes that seem to blow in the door with her. Goodie bags, happy meals, and carnivals—each activity seems to be an opportunity for adding more stuff that we don’t need to our house. How much of a child’s art and school work should a good mom save? For the past few years, I have been preoccupied with my health problems and I fell behind in the battle against clutter. It is a disaster and a source of stress. My doctors say that my condition is worsened by stress so I must reduce my sources of stress. No wonder that a UCLA doctor who studies longevity says that clutter shortens lives. I should say that I am not blameless. I bring stuff home, too. Do fabric, yarn, and patterns and art supplies count as stuff? Well, yes and no. They are raw potential, just waiting for my hands and imagination to release them. What about those old sewing magazines and fabrics that someone left outside the guild meeting with a sign, “take me”. Those magazines are full of good ideas and useful information. I gave them a new home. Now the workspaces in my sewing room are so covered in ideas and potential that I no longer have space to work. As an exercise, after a closet purge a year ago, I catalogued all the black bottoms that I still own. (Bottoms mean shorts, pants, skirts and overalls.) I stopped the exercise when I reached 50. How many do I need? I don’t work in a PIB (people in black) environment; I work in a PWB (people with badges) industry. Yet, I didn’t let any of the 50+ go. Sure it sounds easy to get rid of any clothing items you haven’t worn in a year. But what if you made them with your own hands, blood, sweat, tears and ingenuity? How can you part with them? They are a part of your portfolio. Yet there is a man who owns fewer personal possessions than my collection of black bottoms. Wow. I came down with the creeping crud last week and spent the whole weekend inhaling steam. Monday, just when I felt like I was rejoining the living, my stomach started to feel very, very off. My head was also pounding very badly. I took to bed. Mark brought me up some ginger ale. I sipped half the can. Bad mistake. I felt even worse. Iris came in after dinner and asked me how I felt. I told her that I felt very bad. Mark told me to let me rest so she left. She came back 10 minutes later to ask if I felt any better than 10 minutes ago. (She just learned how to tell time and is very proud of that.) I told her that I felt worse. In fact, I thought I was going to throw up. She said, "I am not going to watch." and left again. I sort of made it to the bathroom in time. Mark came in as I was finishing heaving everything I had and then some. Mark left and returned with cleaning supplies while I showered. 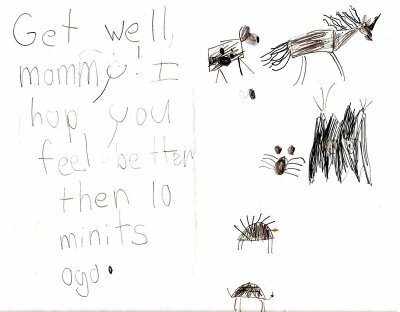 "I drew all the animals I thought you would like to make you feel better. I used the drawing book you got me." And this is why we do it. All those sleepless nights. Because, that comfort comes back to us when we most need it. Today's Foxtrot comic is a real Sudoku. I solved it over coffee this morning. Stop reading right now if you want to try it. 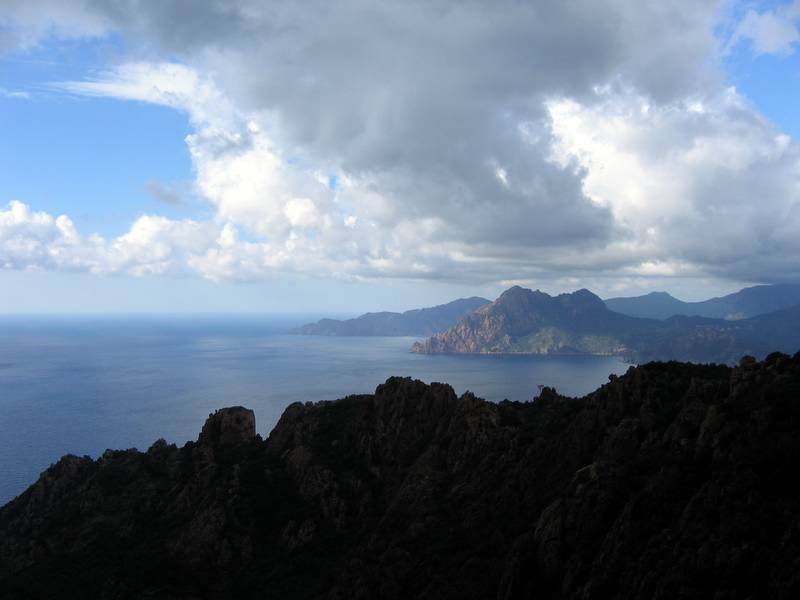 I am going to post gratuitious pictures of our Corsica trip last year so that, even on the largest monitor, you won't get an inadvertent peek at a clue. The current Foxtrot comic is posted here. If another comic shows up, try this link. 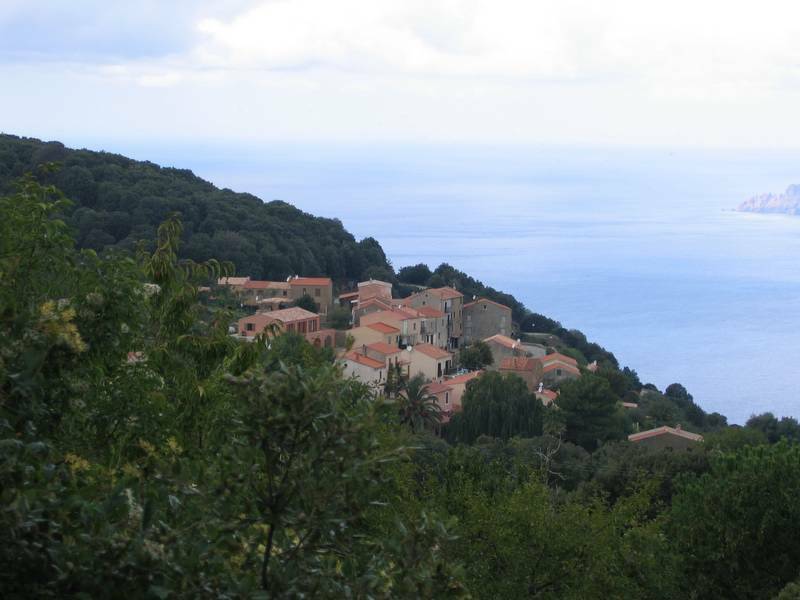 Another picturesque village hanging on a cliff over the sea. Ho-hum. 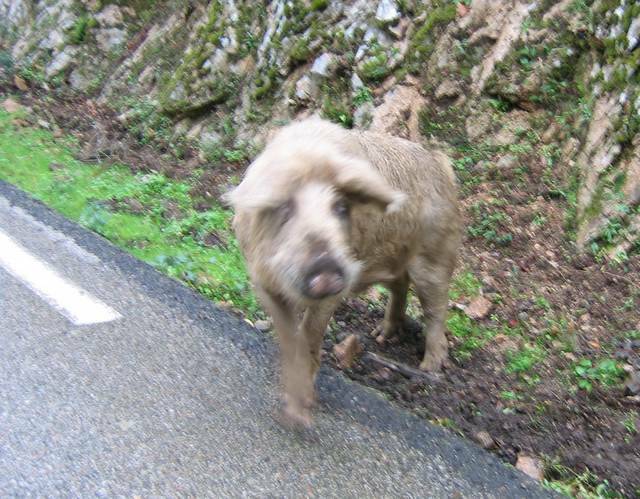 Corsica's famous sausages are made with free-range pigs. Be careful when driving! 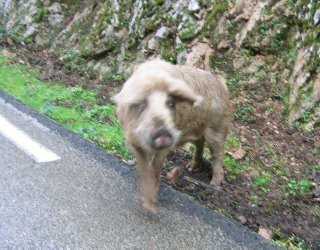 If the Corsican drivers don't get you, the free-range livestock will. Chestnut-infused sausages. Sheep cheese. I am getting hungry. I thought I was so clever because I knew that FF-F8 = F-8. But then I still initially did my hexadecimal math wrong. The mistake was obvious because there couldn't be two 8s in the same row. So I left that square blank until I solved the rest of the puzzle. A maps to 10, not 11. Duh. 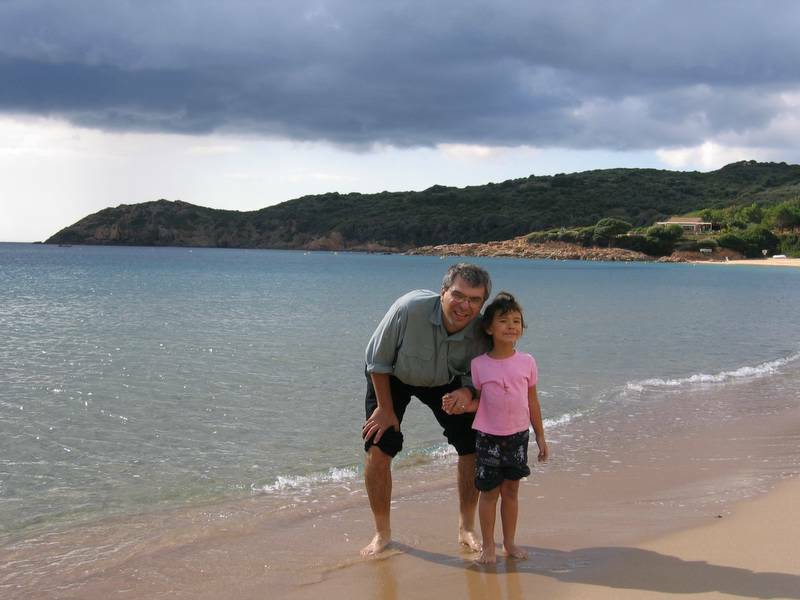 More about why we went to Corsica here. I posted Mark's printable Sudoku template here. I 'talked' to my sister via IM. Funny, she majored in CS and got the hex math right without a hitch. The integral, however, stumped her. I switched majors from EECS to pure math so the integral was easy for me. I had heard of hexadecimal math (and one of my coworkers said she actually used it for solving a software problem with one of our satellites! ), but I had never actually practiced it until last Sunday. So there you have it. Three women using hex. Call the fetishists. If the math section of the SAT was in hex, maybe women would do better than men. Did you know that google calculator can do hexadecimal math? Preface your hexadecimal numbers with 0x. E.g. type 0xff - 0xf8 into the google search engine. But try to do it on your own before cheating, OK? Having trouble understanding text in a foreign language? My sister showed me how we can cut and paste a family newsletter written in chinese into google translator. The translation was not perfect, but we could understand the gist of the letter. I wonder if this will allow me to read and understand Japanese knitting patterns? 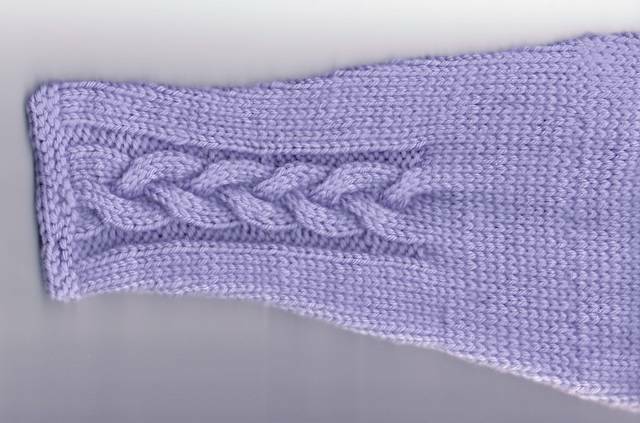 I scanned the sleeve so you can see the braided cable detail. My sister asked for my pattern so I wrote it up and scanned in my schematic. Leave a comment with your email address if you also want it. Her real-life neighbor, Penny, had the same idea. Read what she did on her blog. Before leaving SF for LA, we had sunday brunch at the Garden Court of the Palace Hotel. It's a splurge, but it was my birthday. The last time we had sunday brunch there, they had a string quartet. This time, there was a jazz trio. I asked them to play "God Bless the Child" for Iris. They were not familiar with the song which amazed me because I thought it was a jazz standard. However, they found some sheet music and played it for us anyway. By coincidence, yesterday, Michele Norris interviewed Gladys Knight on NPR. They played a portion of Knight's renditon of "God Bless the Child" and discussed Billie Holiday who is most strongly associated with the song, having recorded it many times. Knight's version is very different from Holiday's but she said that "the point was still there", as applicable today as then. "You gotta get it for yourself." Rich relations give, a crust of bread and such. It is another way to say a mother's job is not done until she has taught her cub to hunt for herself. How popular is the song if 3 professional jazz musicians had not heard of it? I discovered over 50 versions of the song for sale (and sampling) at itunes. I own several versions and each artist has her own take on the song. But Dinah Washingtons' renditon is my favorite. Like Gladys Knight said in the interview, "Dinah was power." I forgot to tell Iris. In one of my superhero counterlifes, I want to be a jazz diva. Summer's bounty of fresh local produce at the markets is winding down. I used to feel guilty about buying produce from the southern hemisphere during the winter until I read an article a few years ago (possibly, but I am not sure, in Technology Review). An expert in energy usage was interviewed about the ecological impact of groceries. He talked about the efficiency of global food processing and shipping. Assuming that the typical American drives 2 miles to the grocery store and buys 20 items at a time, and using the American fleet average MPG, it takes more energy to move a box of Kellogg's corn flakes from the grocery store to the home than it takes to produce the cornflakes and ship them from a factory in Michigan to anywhere in the US. I read another article elsewhere that said that the advent of the shipping container and the efficiency of ocean shipping allows produce to be picked in a field in Chile and in the produce section of American west coast grocery stores in just half a week. It also said that was faster and more energy efficient than shipping produce from the southeastern US. I read another article about the conundrum, "Paper or Plastic?" After a full-up environmental impact study, it came out a wash. The scientist that did the study said the best thing to do would be to bring your own bag. Additionally, he said it didn't matter whether you used paper or plastic if there was meat in your bag. He then went on to explain the huge energy expenditure required to produce meat. Pound for pount, beef production requires roughly twice the resources as pork and pork uses roughly twice the resources of chicken. Amazingly, the most resource-intensive food that we eat are tuna. Cattle are, at least, herbivores. Chickens eat chickenfeed. But tuna are carnivores. Remember the picture of the little fish being eaten by a bigger fish and that fish is eaten by a bigger fish and so on? Anyway, reading these articles was like getting a benediction to eat the foods that I like. 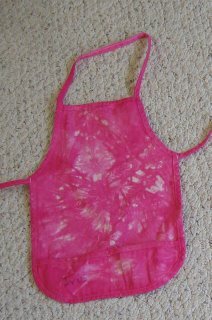 I walk to the grocery store and bring my own tie-dyed cloth bags. I am not a vegetarian, but I do eat small amounts of chicken and pork with my tofu. I enjoy a good steak or burger a few times a year. I also look forward to apple season in both hemispheres. House council in Berkeley. Someone put a note in the box asking why there were no grapes in the house even though they were plentiful in the markets. The kitchen manager replied that we were honoring the consumer boycott of Californian grapes to support the United Farmworkers. In winter, grapes would come from Chile and we were boycotting Pinochet's regime. Luckily, both boycotts are off and I am eating grapes again. When we went to post-Pinochet Chile the difference was amazing. I put my inhaler on the restaurant tables and everyone around us would put out their cigarettes. People would even motion to their tablemates who had their backs to me to put out their cigarettes. It wasn't just the consideration over cigarettes. There were so many reasons to admire their culture and the landscape was awesomely beautiful. Whenever I buy Chilean produce in the winter, I think about all the sympatico people we met there. I am almost done with an item of my own design. I hope to block and blog it over the weekend. I am laid up with a cold right now. True to my badmom moniker, I pulled my daughter out of school on Friday to drive up to San Francisco. We spent yesterday afternoon at Berkeley. We had a good chat with Mark's thesis advisor about science and life in general. We also spent a great deal of time at Black Oak Books and Epicurious Garden in north Berkeley's gourmet ghetto. On our last trip to Berkeley, Iris and I shared excellent gelato in the 'secret garden'. The Valrhona chocolate flavor was the best chocolate ice cream all three of us have ever had. It was expensive, but a transcendent chocolate experience doesn't come cheap. Also on the last trip, the book buyer at Black Oak Books told Iris that, if she took good care of her books, Iris would get more money for the books she didn't want anymore. After that, I saw an increase in respect in the way Iris cared for her books. Iris got $6.75 in trade for the books she brought in. She selected an excellent graphic novel called Babymouse: Queen of the World. Not yet 6 but she has already developed excellent taste in books. Ok, I have to stop bragging about her. Today, we started our day at the new de Young Museum where I saw the Quilts of Gees Bend. Previously, I had bought the exhibition catalog from amazon. That catalog had good photos of the quilts and biographies of the makers. But, as a quilter, I had hoped to learn more technical information about how the quilts were made. It turns out, there is a second touring exhibition of Gees Bend quilts and the catalog for that one, Gees Bend: the Architecture of the Quilt, explains more about the technical aspects of the quilts. I probably will add that book to my collection. The quilts were even more amazing "in the flesh" than in photos. I was drawn to all of them. They all have such graphic power; I was on sensory overload. I was drawn by a couple of details. In Annie Bendolph's "Thousand Pyramids", note the line of half square blocks that oriented in the opposite direction than the rest. 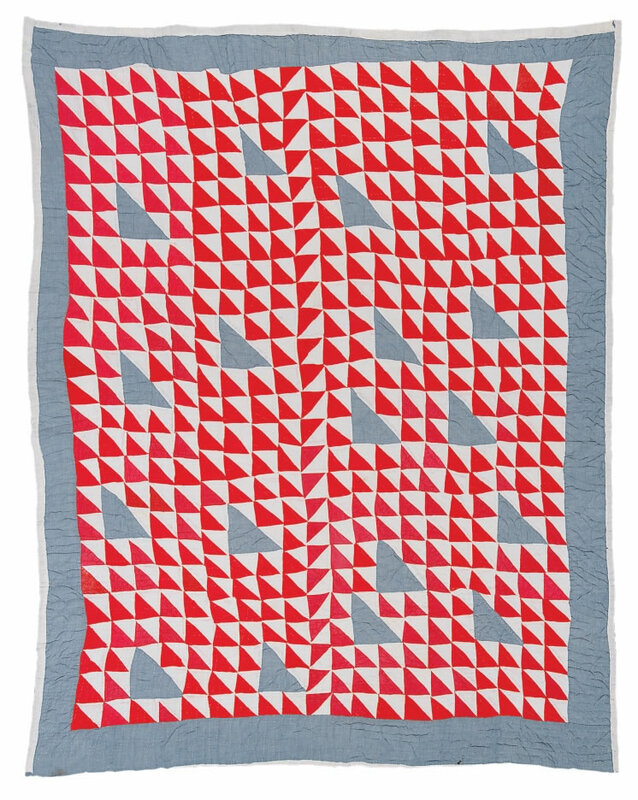 The quilt achieves a sense of tension from that off-kilter detail. 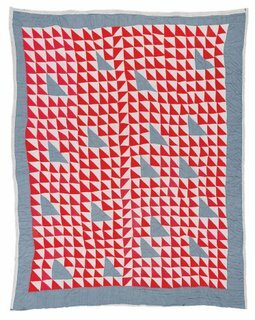 The "My Way" quilts used salvageable pieces of fabric from worn out clothing. I was mesmerized by the complex visual texture achieved with the recycled fabric. I am esthetically attracted to softly variegated colors. The colors were just a by product of the recycled materials used out of necessity by the quilters of Gees Bend. 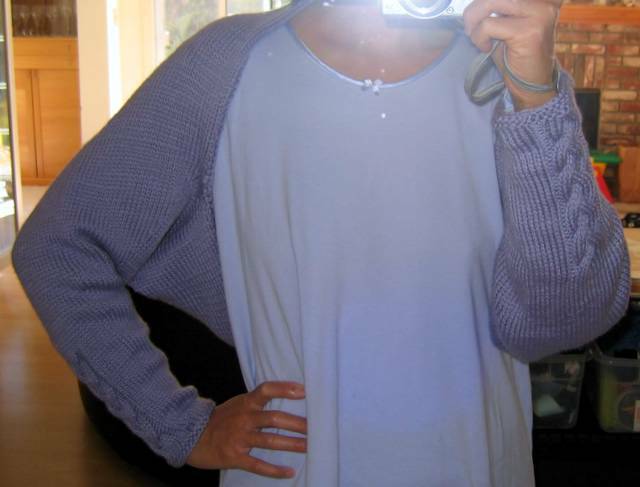 I go to extra effort and expense to hand-dye fabrics and yarn to get that uneven effect. Others have pointed out the irony. The art of patchwork was invented in an era when fabric was scarce and women's labor was cheap. 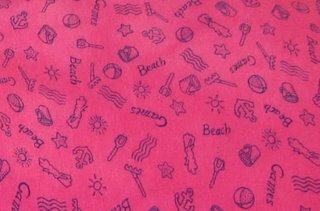 Now, relatively well-to-do women who are short of time buy new fabric that looks like it is old, and cut it up in little pieces before sewing them back together. It is late now; I will post another time about a quilt I made 15 years ago from old fabrics salvaged from thrift store clothes. That quilt was always a favorite of mine. It took a long time, but we were reunited recently. The new de Young museum is breathtaking. 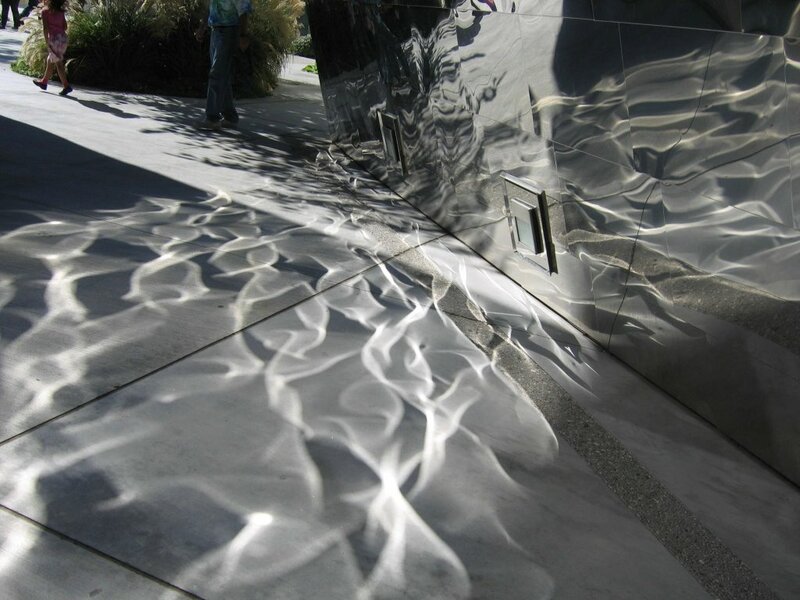 Iris said that the crack in the courtyard was meant to convince kids to enter the museum. I thought the crack symbolized the San Andreas fault or possibly alluded to San Francisco's location on the ring of fire. I like Iris' interpretation, though. After that, we took Muni to Aquatic Park. My sister met us by dinghy and took us to her boat which was moored offshore with friends from her sailing club. We watched the Blue Angels aerial show with plenty of good food, wine and company. Then they surprised me with a chocolate chocolate cake for my birthday. A very full two days, indeed. We took Iris to Girl Scout signups last weekend. Each potential recruit was given a gift. We all know what I think of goodie bags. 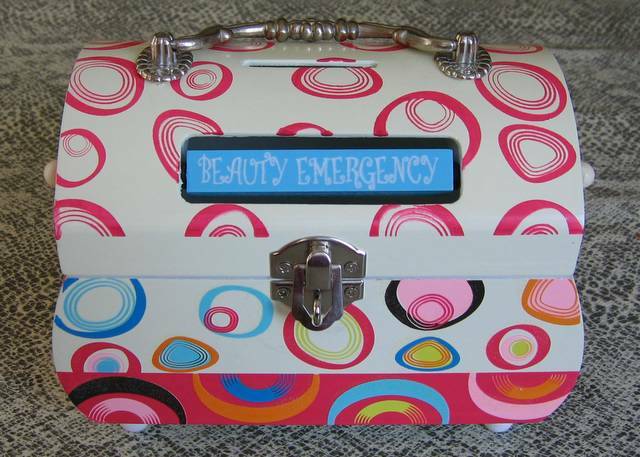 This gift was particularly annoying. The more I think of it, the scarier it becomes. 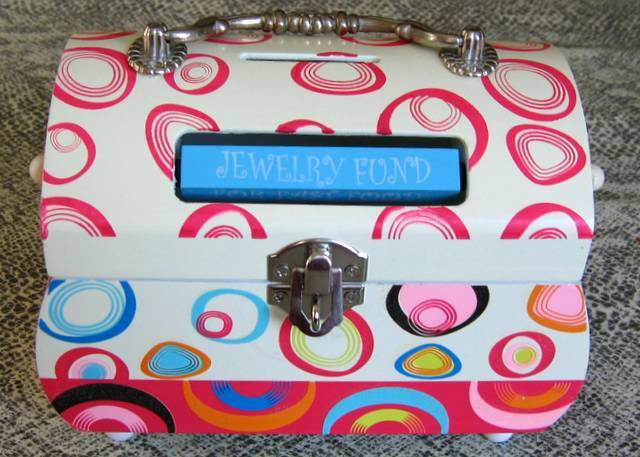 Of course this new-style "piggy bank" is imported from China. That wasn't the major problem. The design of the bank indicated that it was intended to be opened frequently. That wasn't troubling to me. Take a look at the four savings goals that one can switch between. All the reasons to save are for short-term instant gratification. There are no long-term goals like saving for college, retirement or buying a home. Those are the things that would really contribute to the girls' and our nation's well-being. My husband says the bank was clearly intended to be tongue-in-cheek. But I don't think the little girls got the joke. In fact, I think that many grown women don't get the joke. Think about how many women spend their paychecks chasing the latest fashions before they even pay themselves first by saving for their future. This fantasy of living only for today is going to crash hard. On a related matter, I believe that women should save for an additional long-term goal, motherhood. Whether you aspire to be a stay-at-home mom (SAHM) or a career woman, motherhood is expensive. Don't hold your breathe waiting for the nation to tax itself to provide mothers with childcare subsidies. Start taxing yourself right now (this minute!) by saving up for the horrendously high cost of high quality daycare. Put it in a Roth IRA so that you gain the advantage of tax-free compounding and can tap the principal without penalty. If you think that you even might want to remain a SAHM, you can use those savings if needed, to help pay the mortgage while your family lives on one income. This money will be expecially important because of the retirement money that you lose by not being in the paid labor force. In California, the money you save before marriage is yours. It's an extra insurance policy. I hope you don't have to use it for that. I hope you use your savings to make your dream a reality. But saving for a rainy day (even in a place that never rains) will never go out of style. “They’re still looking for an AK-47 he stole from his parents’ house,” Sergeant Gervasi said. Read the story about the 15 year old who stole a bunch of weapons from his parents and took them to school near Las Vegas here. I just want to know what his parents were doing with an AK-47 in the first place. One of the reasons I love walking Iris to and from school is the conversation. One day, she said we can pretend to be a family of superheroes. She asked me, "What would your superpower be?" Then she answered it herself. "Oh, you would be super-fast so you can do everything you need to do." I asked what if I didn't like to be rushed? I like to enjoy the moment. "Then your superpower would be that you can divide yourself up and be in many places at once. You can go to work as much as you like and still be with me all the time." She further mused that, "Of course, we can all fly. And daddy would be superstrong." "What about his memory?" I asked. Oh, it would be excellent. He would be able to remember everything. When I read Superhero Worship by Virginia Postrel in October's Atlantic Monthly, I wondered if Iris and myself were thinking too small. We were thinking of all my different but real personas-but not about imaginary, more glamorous lives. Was this a failure of imagination on our part? Or perhaps a sign that I have a dream life, albeit with a bit less time and sleep than optimal? It's been a while since I read Phillip Roth's The Counterlife. However, I found the central premise extremely compelling. What if we had more than one life? What would we do with it? Addendum: more about my counterlifes here. International Walk to School Day is Wednesday, 4 October 2006. Walking to school provides an enjoyable and healthful way to start or end the school day. It will also help alleviate the unsafe traffic and parking congestion that plague schools around the country. Please consider joining other families in forming Walking School Buses. What is a Walking School Bus? It can be as informal as parents walking their own children to school or it can be as elaborate as New Zealand's "Virtual School Buses" with "drivers", "conductors" and a rope between the two. Why not team up with other families in your neighborhood? When families team up, the amount of time required for each individual parent decreases.